The place is set up in an assembly line format similar to Chipotle, but with a whole lot more options. Looking at the menu, apparently we made it pretty well-known that we had never been before. Suddenly, we were greeted by a guy working there who explained everything on the menu and offered us samples of any meat we wanted. And first he gave us a sample of their fresh-made tortillas to test out. It was delicious. The menu said their Sweet Pork Barbacoa was their specialty, so I tried some of that, their Chile Roasted Beef, their Fire Grilled Chicken and their Fire Grilled Steak. I was surprised to find my favorite to be their Chile Roasted Beef, which somehow beat out the Fire Grilled Steak due to some amazing flavoring. The barbacoa was my second favorite and another customer told us their secret: they cook it in Coke. Have wet with my burrito. 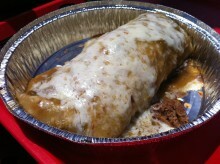 So I went with the Chile Roasted Beef burrito for $6.75. In it, I had them add pinto and black beans, lime-cilantro rice, cheese and hot salsa. Then, they made me an offer I couldn’t refuse. This was to have them splash more salsa on top of the burrito, top it with cheese, heat it up and make it a wet burrito. Um, yes please. But I wasn’t yet sure how hot the salsa was, so I had them douse my burrito in medium. It was a beautiful sight and I couldn’t wait to dig in. And when I did, what I tasted was nothing short of amazing. Stomach aches? Weak. 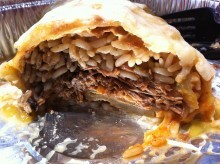 I would risk kidney stones to down a burrito such as this. The flavor of the beef is beyond comprehension, but all at once it’s semi-sweet, salty, juicy and meaty. The meat was definitely the centerpiece to the burrito and while the rice, beans and cheese were all nice, they had nothing on the meat. Which brings me to the salsa. I quickly discovered that the salsa within the burrito was not too spicy at all and could have easily been the salsa for the burrito to swim in. But, I’m glad I tried the medium salsa, because it was awesome. In fact, it was literally sweet. Coupled with the savoriness of the rice, beans and cheese, this salsa added a strange, yet delicious balance to the burrito. Next time, I’ll swap the salsas and get that sweetness on the inside. And there will be a next time. And a time after that. And a time after that. 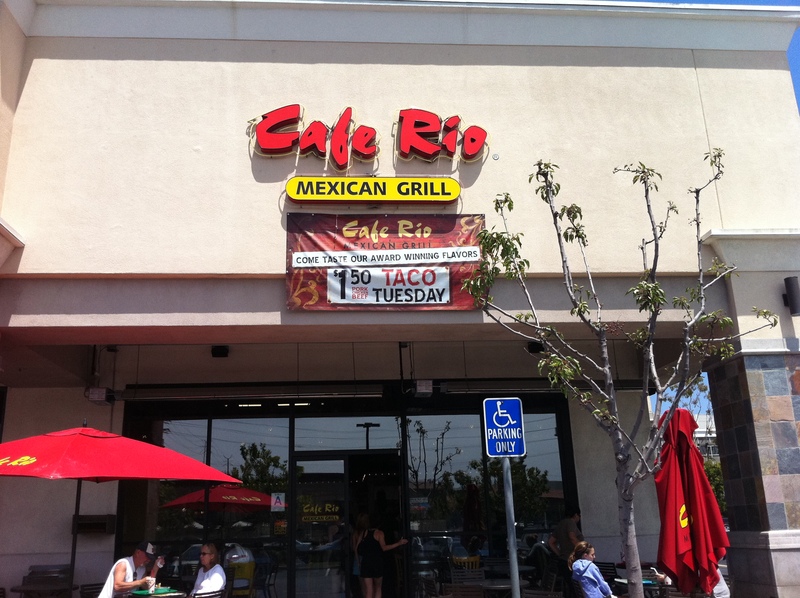 Because Cafe Rio is awesome. From the amazing customer service (seriously, everyone there seemed to feel honored to work there) to the meat to the salsa, it was a burrito to remember. Move over, Chipotle. This is one of my favorite places. You may need to be the judge between them and their near identical competitor Costa Vida (locations in NorCal). I forgot to mention that my favorite is the sweet pork, black beans, cilamtro rice, medium sauce, smothered in saucy goodness and cheese. i wasted eight years of living in Los Angeles until i tried this… LOVE!